In the past, I've always had my photo(s) first, and then selected my materials. 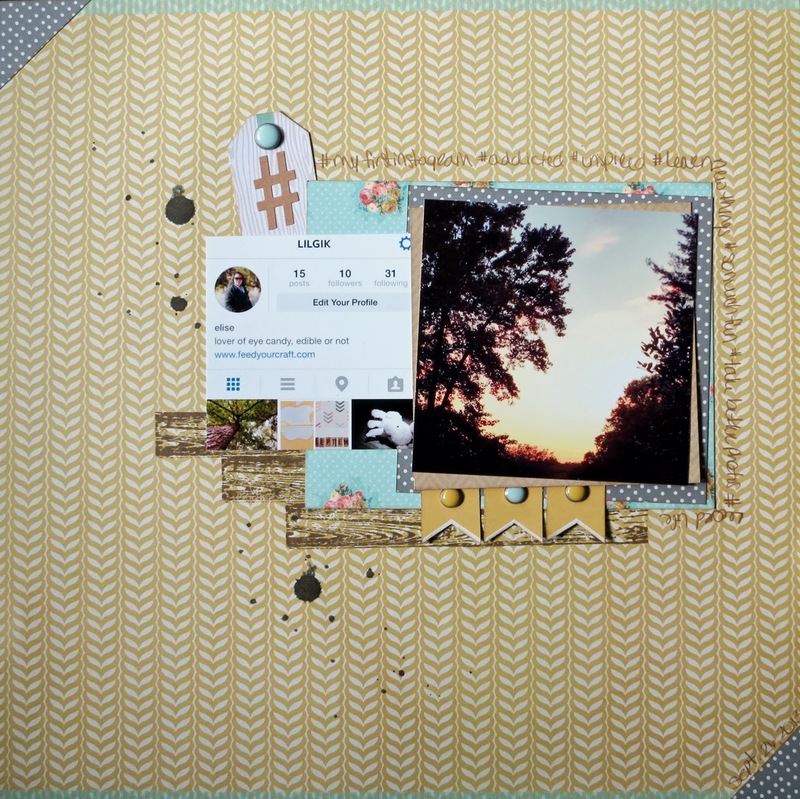 Another benefit to my participation in challenges has been the push to look at my scrapbooking with different perspectives. I've never before worked with a color challenge like the one Life.Paper.Scrapbook puts together monthly. Having kept myself in my comfort zone, I always shied away from them. First, I chose my supplies that matched the palette, and then I needed to decide what to do. With my recent switch in phone brands, I've discovered I really, really like Instagram. I'd never felt one way or the other about it, but now having tried it out, it's safe to say, I'm hooked. I decided I'd make the layout about the first picture I uploaded. My Mind's Eye is one of my favorite manufacturers and I enjoy the challenges they put up as well. I used their current sketch challenge and while I adjusted it to my style, think I still hit on most of the components in the sketch. This layout was definitely a challenge in many ways, all of them good! 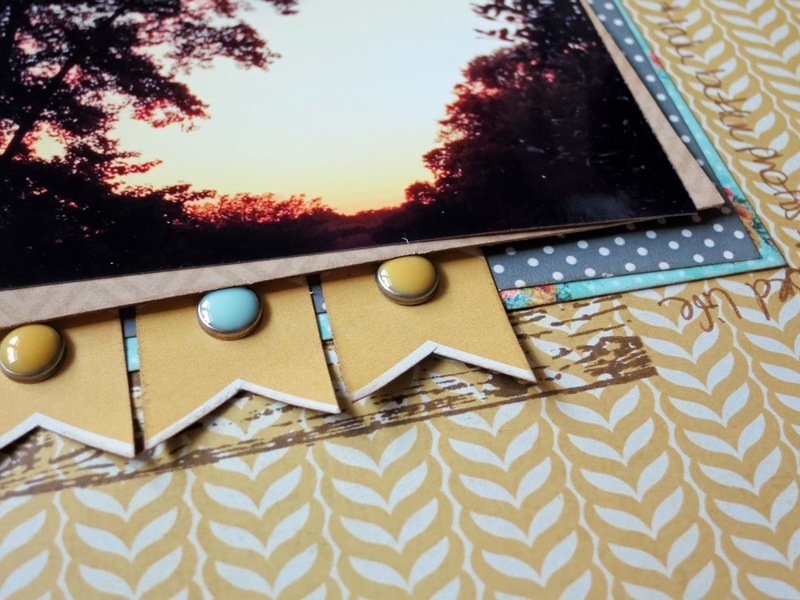 You did a great job, this is a beautiful layout, and the papers compliment the photo so well ! This is beautiful! You did a great job with the challenge. Beautiful layout! I love the hashtag and that you used a print screen from your profile. Genius! Beautiful layout and wonderful design and elements. Beautiful photo! Great job with the challenge! Fantastic job on the challenge, beautiful page. Love it! These are the kind of pages I want to do more of, the ones that capture the things that is normal to us now but maybe isn't in a few years and definately wasn't just a couple of years ago. Who knows what normal in the future? Thanks for inspiring me! This is gorgeous! Love the pennants peeking out! This looks great! I love how you included your instagram profile in it. Thanks ladies, these challenges are keeping me on my toes! Awesome page. I think it's good to push yourself out of your comfort zone. The more you push yourself to do things you aren't comfortable with, the more comfortable you become doing it all. Funny how that works. :) This kind of photo is great for challenges because it's neutral enough to work with whatever you put together. Keep it up! I agree that challenges are pushing me lately. I love a good challenge! Great use of the colors! Thanks for joining us at LPS! Thanks Carol, I'm really enjoying the challenges there!